1-CD with 20-page booklet, 30 tracks. Playing time approx. 73 mns. 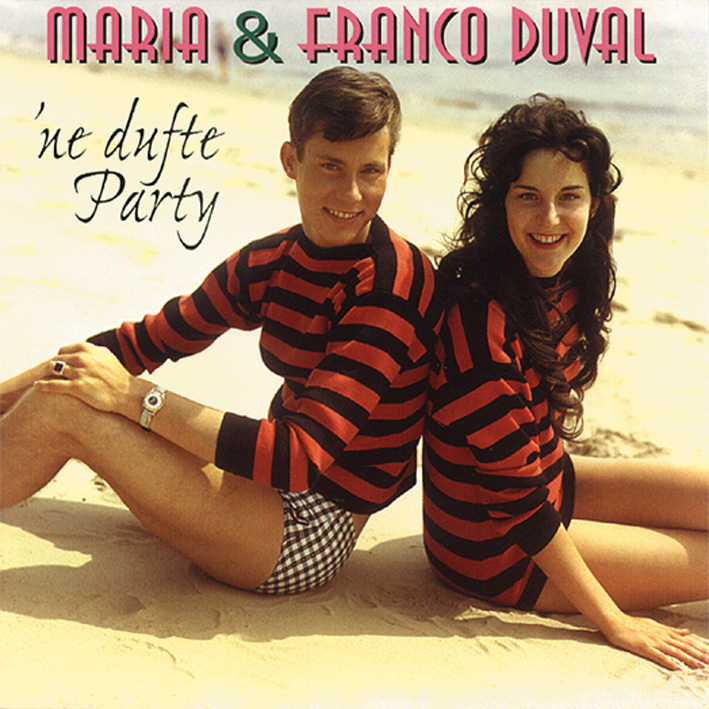 Maria & Franco Duval is another interesting chapter in German pop history. The Berlin siblings were discovered in 1958 in Peter Frankenfeld's TV talent show'Toi-Toi-Toi'. Even teenagers were to address the audience of their age, which they succeeded in doing with modern arranged and harmlessly rhymed songs. Although their perfectly harmonizing voices and their musical feeling in the German pop scene were far above average, they did not manage to make it into the top 10. How much the two have been underestimated is made clear by this compilation, which impressively documents the artistic potential of the duo. Schlager at its best can be heard on this CD - from the smaller successes of the early days to some solo recordings of the 60s. Not only since Gitte and Rex Gildo became the dream couple of the 60s, vocal duos were very popular with the audience. So there were also before again and again singing couples, who tried with more or less success to assert themselves in show business. Among them were the siblings Maria and Franco Duval from Berlin. Even without great hit parade successes, the two were considered the most popular teenage duo in this country for a while. "We both had fun singing and making music even as children," says Ina-Maria, who was born on February 2, 1942. At the age of 10 she toured with the Berlin Mozart Choir under the direction of Erich Steffen. With her bell-like soprano voice, she attracted attention even then and is occasionally taken care of with solo tasks. "I never had stage fright with me. And when there was a mention in the newspaper reviews afterwards, I was always very proud," she reveals with a cheerful smile. At the age of eleven, she took part in a radio audition and was then allowed to participate in radio plays and children's radio programmes. At the same time, her brother Frank, who was born on November 22, 1940 and is thus almost one and a half years older, has already sniffed the theatre air at various Berlin stages and made a name for himself as a young actor. With great zeal he takes ballet lessons until he gets a guitar as a present sometime at Christmas. "From then on he only had music in his head," reports Maria Duval. "He kept strumming on the guitar and singing to it. "I automatically hung myself in with the second voice." That's where it all starts. At a talent competition in the'New World' in Berlin, they win first prize. In 1958 they finally end up with Peter Frankenfeld, who presents talented youngsters in his TV show'Toi-Toi-Toi' and gives them the chance to prove their skills to a large audience. Here, too, their vocal performances are rewarded with stormy applause. But they don't have to be content with that, because they get a record contract with Heliodor. Until then they had appeared as'Geschwister Duval'. For the people in the pop music industry, however, this seems too well-behaved and not modern enough. So they start their record career as'Maria and Franco Duval'. For their debut single, also released in 1958, they recorded two international hits in German with He's Got The Whole World In His Hands and Oh Oh I'm Falling In Love Again and climbed the first steps on the ladder to success. It is the time of the early beginnings of a youth pop culture in Germany. Conny and Peter bring a breath of fresh air to the charts and conquer the cinema screen at the same time. Rock'n' roll is the order of the day. So it makes sense that the record companies are discovering teenagers as a new group of buyers and taking them seriously. And so they tried to launch Maria and Franco - at that time only 16 and 17 years old respectively - especially to young audiences. Rhythmically lively songs, fashionably spiced up with English vocabulary, were intended to encourage the target group to buy the black discs. Customer evaluation for "'ne dufte Party"